Governor of the Province of Neuquen, Argentina, since December 2015. His career in public service includes the positions of Minister of Economy and Public Works (2011-2015), Chairman of the Board at Banco Provincia del Neuquén, provincial bank (2005-2011); In 2003 he was elected Member of the City Council of Neuquen, where he served until 2005, chaired the Finance and Budget Committee of the City Council, and was Leader of the Majority MPN Party (Movimiento Popular Neuquino); Secretary of the Legislative Assembly of the Province of Neuquen (2001 -2003); Undersecretary of the Legislative Assembly of the Province of Neuquén (1999-2001). Certified Public Accountant, holds a degree from the Universidad Nacional del Comahue, Neuquen, Argentina. 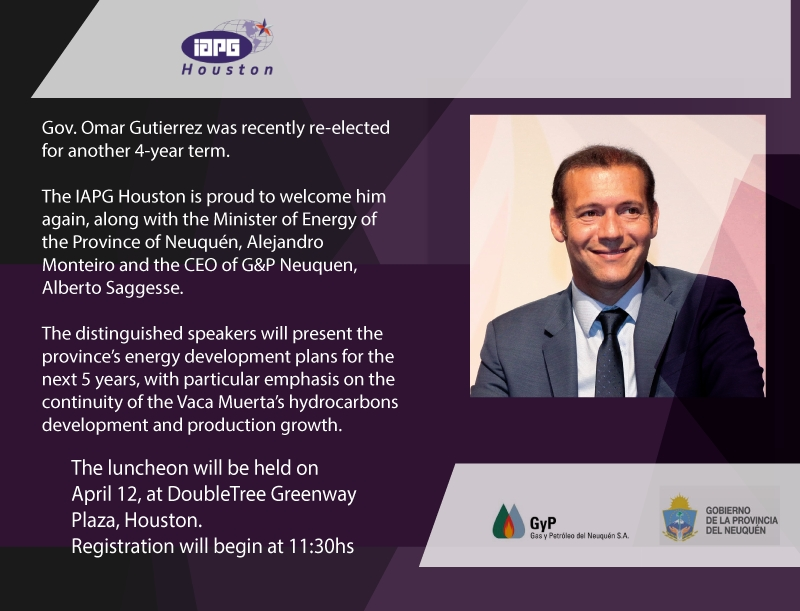 CEO of the provincial company Gas y Petroleo del Neuquén, which he joined in May 2014. He started his career in 1980 with YPF, where he worked until 1983, year in which he obtained a Scholarship to complete his studies in France. In 1985, he returned to Argentina and joined TOTAL AUSTRAL as Legal Advisor. In 1992 he joined Sociedad Comercial del Plata as Legal Department Coordinator, and was promoted to Senior Legal Advisor for Compañía General de Combustibles, position which he occupied until 2000. In 2001 he joined EG3 as Legal Affairs Manager, and subsequently served as Legal Affairs Manager for the Exploration, Production, Refining and Petrochemical Department at PETROBRAS. In 2006 he was promoted to Government Relations Manager. In 2011 he served as General Manager of the Argentine Energy Chamber (CEDERA). Lawyer, holds a Degree from the Universidad Nacional de Buenos Aires (1979), and a Post Graduate Degree in Energy Law from Paris-Sorbonne University (1985).